Lake Keowee Real Estate Expert! Good news! It’s going to be sunny and fairly warm today! More good news, we’ve ripped the wrapping off of 2019 and we’ve hit the ground running. The 2019 Lake Keowee real estate expert team of Mike and Matt Roach is already moving and shaking; we’ve hit on a house and a condo and expect to put a lot and another house under contract this week. We’re working hard on continually updating our Web site with additional videos, new information, improved search set up and much, much more. New cameras, new equipment are here and on the way. We here at Top Guns Realty never stop getting better and being a leader in bringing new technology to the marketplace; ever-striving to get our listings out in front of as many eyes as possible which brings more buyers and sellers together! We truly appreciate all of you folks who worked with us over our 30 years of doing Lake Keowee real estate. Both Mike and I started selling property on this lake in our early 20’s and have focused on learning more about this beautiful lake every single year. We don’t add the expert title lightly, fully understanding this market doesn’t happen in a few short years. You’ve simply got to put in the time and effort and we have and will continue to do so. We hope your 2019 will be a fantastic one and if we can help you out with anything Lake Keowee real estate, let us know. We’re easy to reach as we are constantly at work (and play) right here on beautiful Lake Keowee! As objectively as possible, take a walk through and around your house, trying to look at it as a potential buyer would. Make a list of all the things you would want to change or repair if you were going to remain living here. You may not wind up doing all of these things, but start taking care fo the small and inexpensive repairs and make sure your home is as clean and attractive as possible even before contacting a real estate broker to list your property. Their first impressions of the general appearance of your home will color an agent’s conclusions about how easy or difficult your home will be to sell and about the right price for your home. If you make your home more inviting, the agent will be more eager to bring buyers through to show it off. By making the broker’s selling job easier, you increase your chances of getting the price you want – or at least a price close to it. 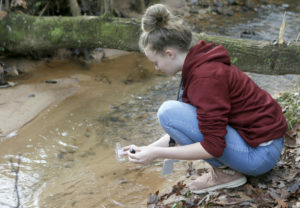 Skyla Peay collects water to be tested form the stream running along the nature trial at Walhalla High School. 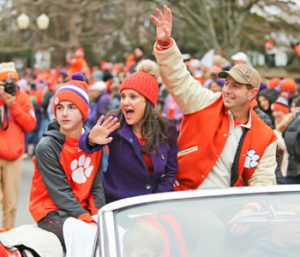 Clemson head coach Dabo Swinney, right, and his wife Kathleen and youngest son Clay wave to fans from the back of a car during the Tigers’ national championship parade on Saturday in Clemson.